On October 15, ten thousand people gathered in Seoul Plaza in front of Seoul City Hall to celebrate the launch of a new progressive party. The Minjung (People) Party is the amalgamation of two left-leaning parties, the New Progressive Party and the United People’s Party (Minjung Yonhap Party), and is a party of workers, farmers, urban poor, women and youth resolved to complete the “candlelight revolution” that ousted Park Geun-hye earlier this year. The formation of the Minjung Party is the first regathering of progressive forces since the forced dissolution of the Unified Progressive Party by the former Park Geun-hye administration in 2014. The party’s two stated priorities are establishing lasting peace on the Korean peninsula and the eradication of precarious labor. The people are at the base of the politics that we strive for. Without the support, strength, and wisdom of the people, progressive politics has no chance of moving forward. The greatest political task in front of us is politics for the people and arousing people to come together in a political convergence. He also expressed hope for the new party to forge a peaceful path out of the grave war threats currently endangering the Korean Peninsula and the world. Following the ceremony, the new members and supporters of the Minjung Party marched through Seoul. 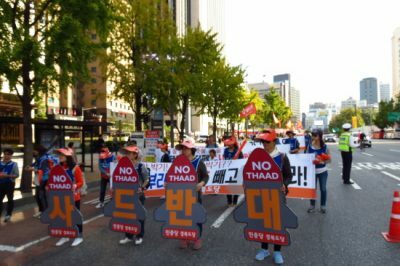 On October 19, members of the Minjung Party held a press conference in front of the U.S. Embassy in Seoul to speak out against the most recent military exercises held by the U.S. and South Korean naval forces. They demand a stop to the joint naval exercises and a start to dialogue for peace. The joint naval drills began on Monday October 16. The exercises included the deployment of the nuclear-powered aircraft carrier USS Ronald Reagan along with other nuclear strategic assets including a dozen destroyers with missile capabilities as well as F-22 and B1B bombers. The USS Ronald Reagan will likely remain off the coast of the Korean peninsula through Donald Trump’s visit to South Korea on November 7. The party representatives also called on South Korean President Moon Jae-in to stand up to the U.S. government and assert South Korea’s right to self-determination and peace.